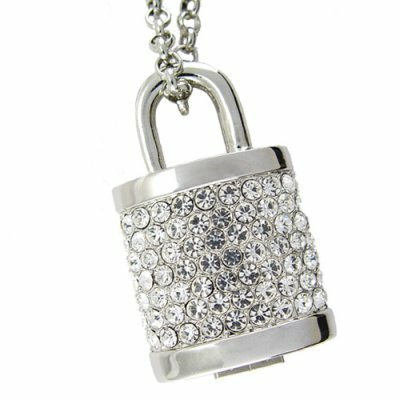 Successfully Added 8GB USB Flash Drive Necklace - Jeweled Metal Lock to your Shopping Cart. 8GB USB flash drive necklace with jeweled metal locket style pendant. This All metal heart shaped necklace and jeweled pendant not only looks nice but is totally useful because it contains 8 GB of flash memory for storing all your important data. These days a USB flash drive is as necessary as your house keys. Whether you are taking large work files back and forth from the office or are sharing pictures and music with friends, nothing beats the convenience of a USB storage drive. Well, why not make sure the one you get fits the style of the person who is going to carry it? This is a elegant metal and jeweled heart necklace that has a built in 8GB's of memory so you or your loved one will have enough space to keep those treasured memories close at heart. This elegant USB flash drive necklace is available right now at a great wholesale prices with full QC testing before shipment from Chinavasion. Locket USB necklace for every day wear. 8 GB's of memory is enough to store more than two thousand documents, pictures and music files. It really very nice item. on 2009-06-21 11:09:21 Nice Item!! This item looks very nice. Instead of taking the chance of you having this type of item hanging from your key chain, I think it's more secured around your neck, plus it looks nice and attractive.